Today was Day #2 of Chocolate and Cheese Theme Week. Several of the chocolates selected for this theme week were related to cream cheese. Of all the cheeses, this one may blend the most naturally with chocolate -- whether in cheesecakes, cheesecake brownies, refrigerated pies, parfaits, spreads or other desserts. 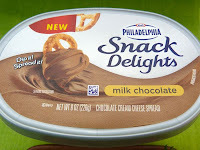 Philadelphia is a well-known cream cheese brand in the U.S. Part of Kraft Foods (Northfield, IL), the Philadelphia brand has been extended to include several flavored cream cheese spreads over the years. 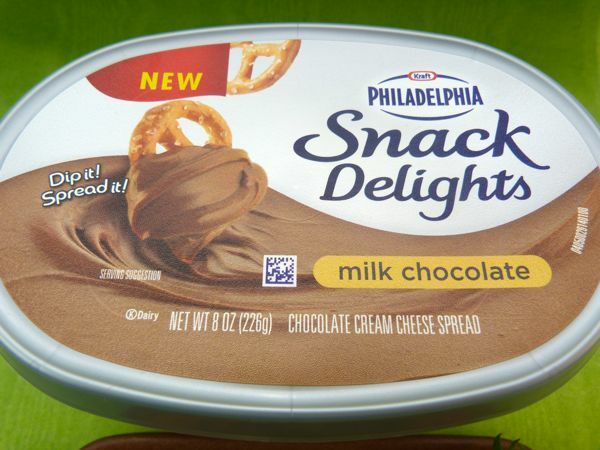 Today's "Snack Delights" cream cheese spreads were packaged in small recloseable plastic tubs and could be used as dips as well. Today's two flavors I sampled, Milk Chocolate and Cinnamon*, were also sweet enough to serve as cream cheese frosting for cakes, banana bread, or cupcakes. This could be wonderful news, or not, depending on your preference for sugar. I assembled a fruit, nut and snack plate (strawberries, blueberries, almonds, gluten free pretzels and gingerbread cookies) to eat with these spreads. 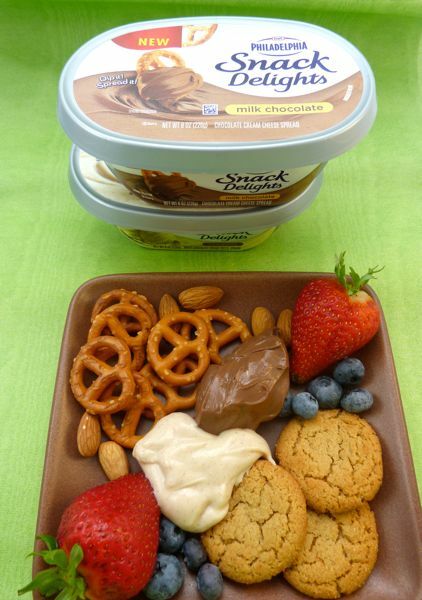 I enjoyed the white chocolate cinnamon spread as much as the milk chocolate cream cheese with these snack items. *Note: I do not normally "count" or feature white chocolate items on ChocolateBanquet.com; however, the cinnamon white chocolate cream cheese did pair nicely with the snacks and with its milk chocolate sibling.